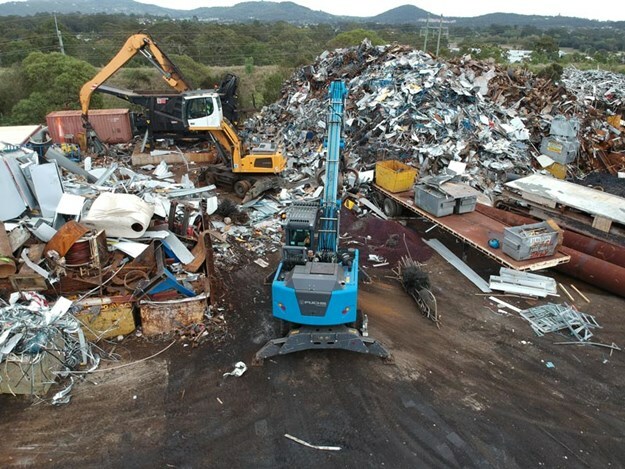 Recyclers Australia has been servicing the needs of the manufacturing industry and general public for over 30 years, specialising in scrap metal and waste management. The company manages collection of all sorts of general waste, skip bin hire, complete commercial metal management plans and everything in-between. The company prides itself on its resource recovery programs and is committed to developing strategies that enhance a renewable economy. Recyclers Australia currently have a fleet of 13 trucks on the roads in Brisbane and export to a range of countries including India, South Korea, Indonesia, China, Pakistan and more. The latest addition to the fleet is a Fuchs MHL335 material handler and the company is singing its praises. "We have four material handlers including a Fuchs MHL350," Recyclers Australia director and trading manager Alan Morgan says. "We have had our newest machine, the Fuchs MHL335 for a couple of months now. When I make purchase decisions I rely on my operators’ feedback and experiences with different brands and machines. "We do 40-50 containers per week and use the Fuchs machines to load the containers and high-speed baling machines, so the material handlers need to be reliable, fast and efficient. The Fuchs machines tick all those boxes" Morgan explains. "Another key thing for us is aftersales support and service. We have two mechanics who look at all machines before we buy them and determine the ease of service & accessibility. The other aspect is parts. The Fuchs parts are more easily accessible than some other brands on the market and the support by the Fuchs agent Onetrak has been excellent"
Operators at Recyclers Australia are also impressed with the Fuchs MHL335, noting the machine’s excellent visibility and ease of use. "Visibility from the cab is great and the controls are very smooth. I get about a week out of a tank of fuel, so the machine is very fuel efficient as well," Recyclers Australia operator Pat says. "The sliding door on the new cabin is a great design feature. It makes it easier to open and access the machine in tight spaces. "I operate the machine for 8 hour shifts and still find it very comfortable at the end of the day. The cab has a built-in drink bottle cooler which is a great feature on warm days. I haven’t seen it in any other machines" Pat concludes.